With its awe-inspiring architecture and remarkable concepts of astronomy, the Maya was undoubtedly one of the greatest civilisations of Mesoamerica. At the peak of its glory, around 800 ad, the civilisation extended from Mexico's Yucatn peninsula to Honduras. But after flourishing for about 1,000 years, a society of some 15 million people imploded in almost an instant in the 9th century. Throughout human history, civilisations have risen and collapsed as though their destinies were guided by the wind. It was, however, the rain -- rather, the lack of it -- that sealed the Maya people's fate. This is what palaeoclimatologist Gerald Huag claims to have found recently. Huag picked up the threads of the great Mayan mystery on what was just another day for him in the year 2002. After putting his three-year-old son to bed at 8 o'clock, he started reading The Great Maya Droughts: Water, Life and Death . In the book, author Richardson Gill argued that three catastrophic droughts that struck with the consistency of a metronome were responsible for the downfall of the Maya. This, despite the fact that the community had developed sophisticated irrigation techniques involving canals, reservoirs and gravity-powered rainwater distribution systems around 2000 bc. Mainstream archaeology could never agree with Gill's theory. But Huag, who had been taking climate measurements of the same period, found it fascinating. At about two o'clock in the morning, he checked the latest results from his laboratory at the Swiss Federal Institute of Technology, Switzerland. The data about climate variations in the Cariaco Basin off the coast of Venezuela surprised him. It showed a century ravaged by three successive droughts in ad 810, 860 and 910. Cariaco Basin, located off the coast of Venezuela, is hundreds of kilometres from the Maya sites in Mexico, Guatemala and Belize. But it is affected by the same weather pattern as these areas. Over the past century, archaeologists have relied on palaeontology to dig for clues about primitive life. Though research yielded beautiful portraits of the Maya achievements, it never answered the big question: why did the 'great scientific civilisation' collapse all of a sudden? In the 1990s, a group of geologists and palaeoclimatologists began linking the science of ecology with archaeology. They started pondering whether environment was the missing link or not. Is it the environment that makes civilisations flourish or perish? Gill, a former banker and a freelance archaeologist, was intrigued by the phenomenon. As a child growing up in Texas, usa, Gill had seen several severe droughts. He had experienced the havoc that the dry spells could play with humanity. In the 1980s, he started investigating a hunch that drought killed the Maya. Many archaeologists tried to dissuade him from continuing this study, but nothing could deter Gill. His first supporting evidence came in 1995 from geologist David Hodell at the University of Florida, usa. He and his team examined layers of sediment underneath Mexico's Chichancanab lake, which showed the first evidence of a catastrophic drought around the turn of the 10th century. That was enough for Gill. In his book, published in 2000, he proposed dates for the three severe droughts that were responsible for the downfall of the Maya. But there were other evidences that Gill was blissfully unaware about. In 1996, a 170-metre-long tube of sediment intrigued Huag. After all, it encompassed 500,000 years of climate history. Six centimetres wide and greenish-brown, the sediment was made up of millions of tiny layers, with each half millimetre telling endless tales about a year. As Venezuela's rivers are enveloped by the Cariaco Basin, they leave a titanium mark in the sediment that reveals how much rain fell that year. Titanium is an indicator of rainfall, explains Huag, because higher precipitation washes more of the metal from the land into the ocean floor sediments. The difference in concentration between the wet and dry season each year is as much as 30 per cent. "We looked in detail at the period corresponding to the 9th and 10th centuries, taking measurements per 30 centimetres of the sediment and found three extreme minima," says Huag. The timings matched periodic downturns in the Maya culture, as demonstrated by abandonment of cities or diminished stone carvings and buildings. In 2002, Hodell and his colleagues went back to the Chichancanab to document the amount of gypsum deposited annually on the lake's floor over a 2,600-year period. A reduction in rainfall causes extensive evaporation of the lake's water, leaving more gypsum deposited annually on its floor. Surprisingly, the scientists found that the region was hit by a drought every 208 years. Today, the efforts of Hodell and Huag have convinced the world that thirst was what killed the Maya. Experts say the Maya civilisation was particularly susceptible to long droughts because about 95 per cent of its population depended on rain-fed lakes, ponds and rivers, containing on an average an 18-month supply of water. Archaeological data shows that the Maya communities in the southern and central lowlands collapsed first, while those in the northern highlands lasted another century or so. This was possibly because they had access to more groundwater resources. In the end, however, they couldn't survive the extended dry period. The most astounding finding is that the recurrence of the drought was remarkably cyclical, occurring every 208 years. This interval is almost identical to a known cycle in which the Sun is at its most intense every 206 years. Archaeologists know the Maya could precisely measure the movements of the Sun, Moon and planets, including Venus. Hodell says he is unaware, however, of any evidence about the Maya knowing anything about the changing intensity of the Sun. "It's ironic that a culture so obsessed with keeping track of celestial movements met its demise because of a 206-year cycle," he says. Climate researchers using tree ring dating (dendrochronology) have also found evidence of a bicentennial drought cycle in step with the variation in sunlight. The drought theory is being considered controversial by some archaeologists who believe a combination of overpopulation, internecine struggle for control among the nobles, weak economic base and a political system that did not foster sharing of power led to the collapse of the Maya. One hypothesis suggests the Maya caused their downfall by indulging in activities like deforestation, which led to environmental degradation. Defenders of the climate change theory, however, say the droughts sparked a chain of events that led to deforestation. "Sunny days don't kill people," says Gill. "But when people run out of food and water, they die." While the Maya had learned to live with shorter droughts, the study indicates that a more subtle, long-term drying trend was what pushed the civilisation over the edge. "Not only did the Maya have to face an intense climatic catastrophe, but the duration was something that they had never experienced before -- a fact that has profound implications for humanity to date," says Huag. Other human societies have also succumbed to climate swings. In Mesopotamia, a canal-supported agricultural society collapsed after a severe 200-year drought about 3,400 years ago. With wetter conditions, civilisations thrived in the Mediterranean, Egypt and West Asia. Ten years after their economic peak in 2300 bc, however, catastrophic droughts hurt agricultural production and caused regional collapse. Then there are other societies that have survived climatic shifts by adjusting to the environmental variations. About 300 years after the collapse of the Maya, the Chumash people on California's Channel Islands withstood severe droughts by transforming themselves from hunter-gatherers to traders. Experts say the collapse of the Maya could serve as a valuable lesson for present-day societies which are vulnerable to droughts in Africa and elsewhere. When droughts strike, they can trigger a chain reaction beginning with crop failure. This, in turn, can lead to malnutrition, increased disease and competition for resources, and ultimately cause socio-political upheaval. "We can handle climate change if we're prepared for it," says Huag. 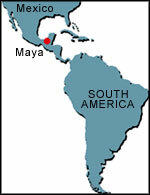 "The Maya were not prepared. We are no better." If the world has been so vulnerable in the past, it is certainly at risk in the future. The findings provide some food for thought for our own civilisation, which is already facing the wrath of global warming.